The Field Notes Dime Novel notebooks are a homage to an 1860s American publishing phenomenon. The Fall edition of Field Notes is a recreation of the Dime Novel: the typesetting, the printing, the compact size, paper stock and sewn bindings. Field Notes selected a dusty orange cover and overheated advertising copy to reproduce this notebook with a few Field Notes touches such as the rounded corners and high quality paper. The special edition Field Notes Dime Novel is smaller than most Field Notes at 4-1/2" x 6-1/2". The cover is 100# French Paper Co. Construction “Safety Orange” with the interior pages of “Natural White” Strathmore Premium Wove 70# paper. This is the highest quality paper they have ever used in a Field Notes notebook with 72 body pages. Aside from page numbers, the interior pages are blank. 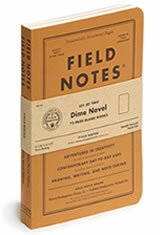 The Field Notes Dime Novel Memo & Notebooks usually ships within 1 business day unless otherwise specified. Each Field Notes Dime Novel Memo & Notebooks we sell is guaranteed to be genuine, authentic and will arrive brand new & unused! Y’all. These field notes are actually fountain pen friendly. Finally. I used a firehose medium-broad nib on this paper, and still did not get bleed, feather, or spread. It’s so good. You need some of these field notes. The size is great, the quality is great, and they look so cute.